Some Adobe software infuriates me (Flash), I don’t like their PDF reader and use Foxit instead, apps which use Adobe-Air always seem to leak memory. But I love Lightroom . It does things right – like installations – which other Adobe products get wrong. It maintains a “library” of pictures and creates virtual folders of images ( “collections” ) but it maintains metadata in the images files so data stays with pictures when they are copied somewhere else – something some other programs still get badly wrong. My workflow with Lightroom goes something like this. Shoot pictures – delete any where the camera was pointing at the floor, lens cap was on, studio flash didn’t fire etc. But otherwise don’t edit in the camera. Copy everything to the computer – usually I create a folder for a set of pictures and put DNG files into a “RAW” subfolder. I keep full memory cards in filing sleeves meant for 35mm slides.. Using PowerShell I replace the IMG prefix with something which tells me what the pictures are but keeps the camera assigned image number. Import Pictures into Lightroom – manipulate them and export to the parent folder of the “RAW” one. Make any prints from inside Lightroom. Delete “dud” images from the Lightroom catalog. Lightroom locks the database files exclusively – you can’t use the ODBC driver and Lightroom at the same time. If something else is holding the files open, Lightroom won’t start. The ODBC driver can run UPDATE queries to change the data: do I need to say that is dangerous ? Good. Note that since some images don’t have a camera or lens logged the joins to those tables needs to be a LEFT join not an inner join. Again the version I use in PowerShell has a Where clause which inserts a parameter. OK so much for file data – the other data I wanted was about collections. The list of collections is in just one table (AgLibraryCollection) so very easy to query, and but I also wanted to know the images in each collection. Since one image can be in many collections,and each collection holds many images AgLibraryCollectionImage is a table to provide a many to relationship. 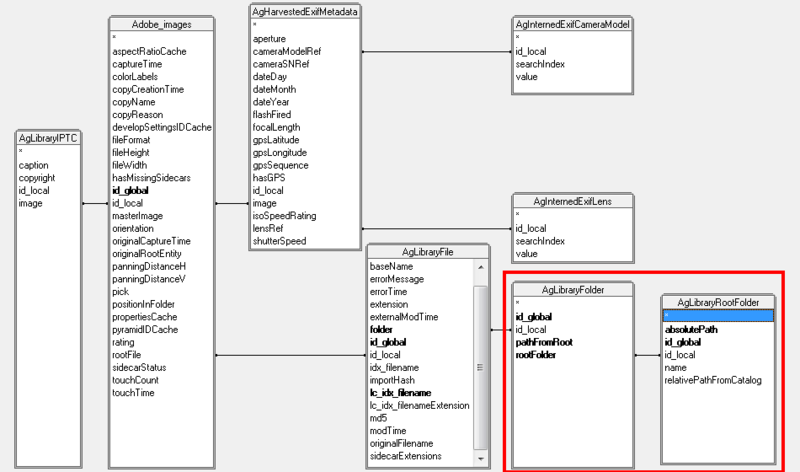 Different tables might be attached to AdobeImages depending on what information one wants from about the images in a collection, I’m interested only in mapping files on disk to collections in Lightroom, so I have linked to the file information and I have a query like this. 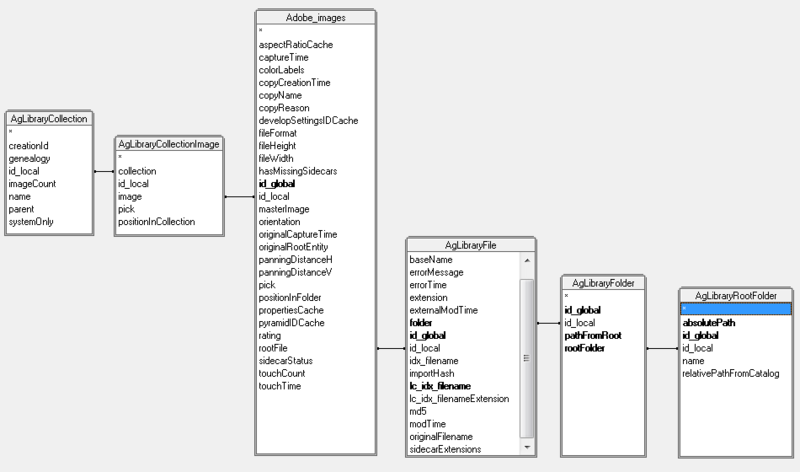 Stores paths of lightroom items in the current folder ending in .DNG in $paths; then gets files in the current folder and moves those which are not in $paths (i.e. in Lightroom.) specifying -Whatif allows the files to be confirmed before being moved.